Gala Performance, based in Rotherham, is demonstrating its commitment to amateur motorsport by securing the title sponsorship for the popular Toyota MR2 Championship. A brand of the highly successful Manvers-based events industry supplier Gala Tent, Gala Performance is a specialist in supplying shelters and awnings, premium garage flooring, exclusively developed pit walling systems, racewear, tools and lifting equipment, as well as pit, paddock, and promotional solutions to the motorsport industry. Following the deal, the series will now be known as the "Gala Performance Toyota MR2 Championship" for the 2018 season. The championship features a total of eight race weekends as part of the 750 Motor Club's racing package, of which four rounds will be televised on dedicated programmes on Motorsport TV. 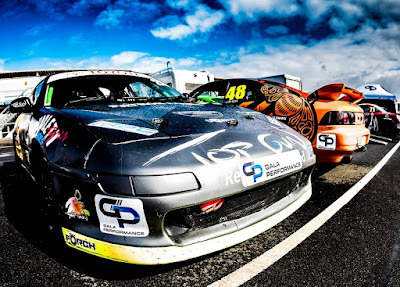 The UK's most affordable mid-engined sports car racing series attracts grids of up to 50 cars, all of which will be displaying the Gala Performance brand name. Ryan Bracha, business development officer for Gala Performance (pictured, right), said: "Securing this title sponsorship demonstrates our commitment to becoming the supplier of choice to grassroots and club level motorsports teams. "The MR2 Championship attracts a lot of drivers to come and get on the grid, as well as having the full support of Toyota, so it's an excellent business opportunity for us too. We're very excited about this new sponsorship and look forward to following the success of the championship during this its tenth anniversary year!" The Gala Performance team will be on hand to support the series and the competitors, hosting the Gala Performance Toyota MR2 Championship hub at every date in the championship calendar. The first of which was at Donington Park on last month, but it will also include Brands Hatch, Mallory Park, Rockingham, Cadwell Park, Silverstone (incorporating tenth anniversary celebrations for the championship) and Snetterton. 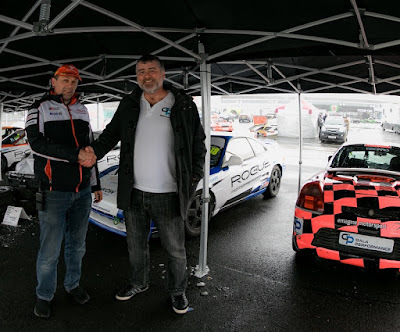 Patrick Mortell, championship co-ordinator (pictured, left), said: "Gala Tent has been a part of the MR2 Championship paddock since we first started, as many of our competitors use the company's durable pop-up structures as awnings, temporary workshops or garage space. Gala Performance offers motorsport specific variants of the products that can be branded to suit along with other paddock staples such as flags, banners, folding tables and chairs. As we celebrate our tenth anniversary as an MSA championship, Gala Performance will help to bring a professional look to our grassroots racing series." The Gala Group of companies sponsored United Autosports in 2016, which went on to win the European Le Mans Series LMP3 class championship. In 2017 the sponsorship deal was renewed under the Gala Performance name, placing the company's branding onto the LMP3 cars for a second season as the team defended its title. The firm's directors have also set up their own race team - Gala Performance Motorsport. Working closely with 2015 GT Cup champion Rob Gaffney of Amigo Motorsport, the team is set to compete in the C1 Racing Club endurance series that starts at Rockingham Motor Speedway in Corby in May.